With the Grundig G6 Aviator at your side, you will always have great listening options. 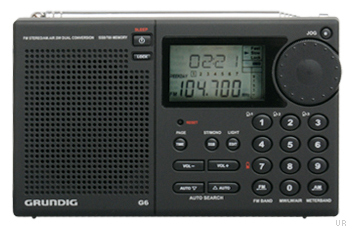 Tune in to longwave, AM, FM, the VHF aircraft band or shortwave frequencies easily with direct keypad entry. Or, use the AUTO tuning feature to browse stations and stop on the next available frequency. You can also use "D5" tuning to get a taste of what’s playing—stop on the next available frequency for five seconds at a time. This advanced dual conversion circuit also features the reception of S.S.B. (Single Side Band) signals. Use the international 24 hour clock with 3 wake-up alarms to keep you on schedule, wherever your travels take you. 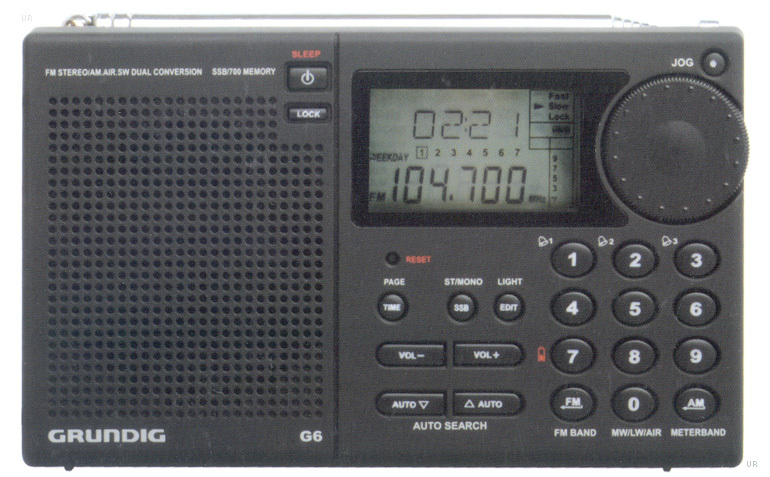 This radio has 700 alphanumeric memories, arranged in 100 pages. They are random memories, meaning each memory can be used for any frequency or band. The display is backlit and there is an external antenna jack (3.5 mm mini). The display features a signal strength indicator and there is a stereo-mono plus a mega-bass switch. This radio tunes 150-29999 kHz to include all longwave, medium wave and shortwave frequencies. FM coverage is 87.5-108 MHz and VHF Air is 117-137 MHz. This radio comes with an AC adapter, carry pouch and earbuds. It can operate from two regular or NiCad AA cells (not supplied). 5 x 3 x 1.2 inches 9 oz. Universal Radio also offers the limited production Grundig G6 Buzz Aldrin Edition celebrating 50 years of space travel. Copyright 2008-2015, Universal Radio, Inc.